Do longer growing seasons mean bigger seeds? Home » News » Do longer growing seasons mean bigger seeds? Researchers at the University of Granada have proposed, for the first time, 'universal laws' for seed size and biology. Using mathematical models and an exhaustive data analysis of 500 plant species, they showed that the global distribution of dormancy and seed size follow a predictable pattern that depends on climate. In the research published in New Phytologist, the authors show that global patterns of seed dormancy and size are a result of the adaptation to seasonal environments. In environments where the growing season is short, smaller, dormant seeds are favoured, whereas in the tropics, large non-dormant seeds tend to dominate. Longer growing seasons mean bigger seeds. 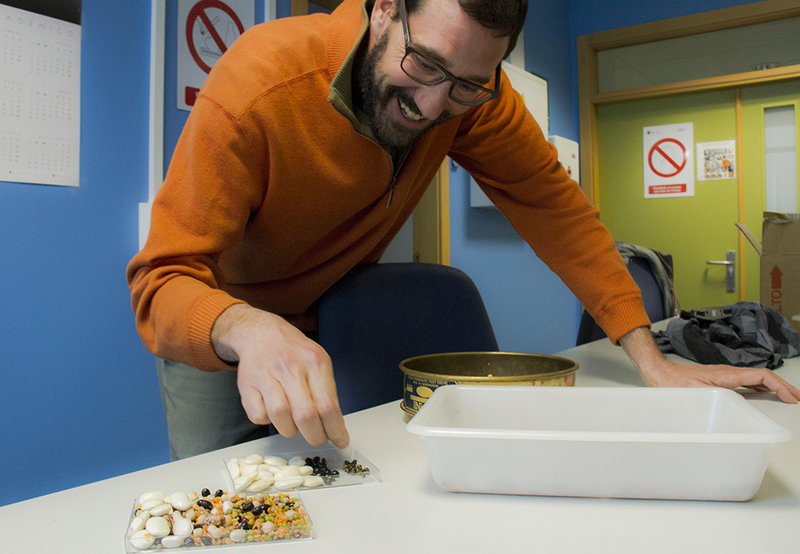 Rafael Rubio de Casas, from the Department of Ecology at the UGR School of Science, with some seeds. Rafael Rubio de Casas, researcher at the University of Granada, concluded that, thanks to the data obtained from this study, they will be able to make predictions on plants that will occupy different habitats and even determine which plants will better adapt to a particular environment. This news item contains elements from an original press release, which is also available in Spanish and French.